Using the Universal Kayak Cart makes moving and transporting your Nucanoe extremely easy. Enhanced large diameter wheels simplify transport over uneven terrain. The anodized aluminum construction makes it a lightweight and easy to maneuver. 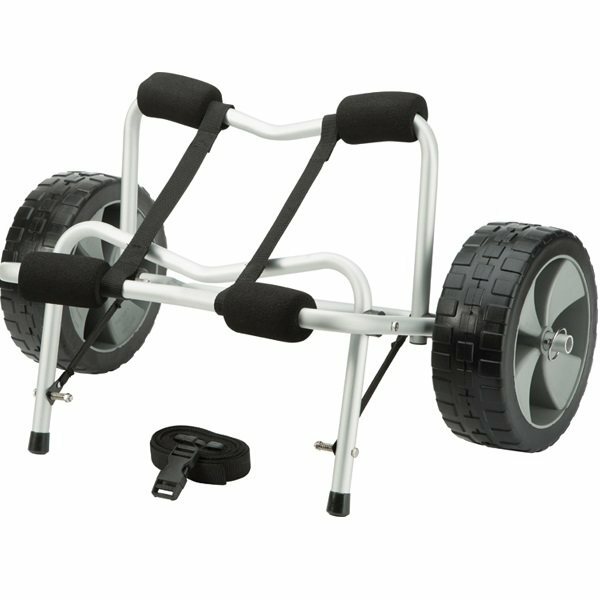 You can load and unload your boats with ease because this cart boasts a kickstand that is fully retractable. The soft, foam pads on this Aluminum Cart will help to protect your boat's finish from accidental damage that could happen during transport. This cart also boasts nylon webbing that is tough and durable. This webbing also can be used as a tie-down strap. This cart also comes with a strap to keep the cart secure. This cart is a great choice for transporting your kayak or canoe.